Speaking of Florida again, we used to celebrate Pan-America day, recognizing the countries to the south of us. Canada somehow never came up. I understand the day is still recognized although I have not heard the term in some years. We always hoped that in some ways Pan-America would become like us in terms of prosperity and political stability but we never begrudged them their distinctive culture, styles and holidays. Change is coming there fast. (Autumn of the Patriarchs ECONOMIST vol. 407 no. 8838 June 1, 2013 page 40.) . Take a look at the graph below. The information was taken by the ECONOMIST from Centre d’Estudis Demogràphics, Universitat Autònomia de Barcelona. 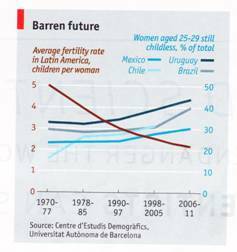 The descending red line traces the number of children per woman in Latin America from 1970 to 2011. It falls from about five to just above 2 – just replacement level – during that time. The rising lines trace the percentage of women 35-29 who are childless for four countries. Fertility has crashed. That is no surprise. Fertility is falling the world over. The shocking thing is that it happened so fast, twice as fast as it happened in the developed world. One caution, and the concern of the article, is that this rapid change gives little time to prepare for an inverted population distribution. In poorer countries there are many young people compared with old people; taking care of the old is feasible. In rich countries there are relatively few young people; we are just coming to terms with the fact that taking care of old people could take a disproportionate amount of available resources away from serving the most productive people. It’s hard enough for us. It may mean trouble for places that are not so prosperous and have half the time to make the change. The vertical axis is the average number of children born per woman. The horizontal axis gives the dates of the surveys. The numbers are broken down into rich world, middle world and poor world. The implication is that the time course is stereotyped. If Latin America is just now at the point we were thirty years ago, just dropping below replacement, they ought to be where we are now when it gets to be thirty years from now. We may not be so lucky. Compounding the worry is that cohabiting, which has developed in the rich world, didn’t become really popular until the fertility had kind of stabilized for a while. Now I take it that cohabiting instead of marrying is determined by the same mechanism as infertility. It is what people want and what they want is highly controlled by epigenetic changes to their DNA. And cohabiting is already very popular in Latin America. If you ask me, the Western world is trapped by the Gadarene swine fallacy. I can do no better than copy from another site and give you the link. The GSF is the fallacy of supposing that because a group is in the right formation, it is necessarily on the right course; and conversely, of supposing that because an individual has strayed from the group and isn't in formation, that he is off course. The individual may seem lost to the group but not off course to an ideal observer. Background: Gadara was the ancient city of Palestine southeast of the Sea of Galilee and subsequently destroyed. The name was later adopted by a district east of Jordan and called Gadarenes, or Gergesenes. It was the site of the famous miracle of the swine, in which Jesus conjured demonic spirits into the body of swine and let them perish in the sea. The story is recounted in the Synoptic Gospels. http://www.philosophicalsociety.com/Archives/The%20Gadarene%20Swine%20Fallacy.htm Downloaded June 27, 2013. Well we are all (save me and thee of course) saying that there is no demographic problem except that there are to many babies in the world; see, the fertility is leveling off just where you would want it to. But this assumption is made with total disregard for any mechanism. It is assumed to be “choice.” That’s hard to believe when something is so predictable. And the mechanism, so far as I can make out the weight of the evidence, has two components: pre-zygotic and post zygotic. The post-zygotic develops steadily and is rather forgiving. The pre-zygotic strikes like a summer storm and is unforgiving. Now it looks like the rich world, Pan-America and presumably the rest of the neither-rich-nor-poor world, are neck and neck on the race to the Sea of Galilee. There have been 90 visitors over the past month.